Busy days, a few weeks ago, my mom had a unfortenate run in with her health and had to be sent to the hospital for a few days, a stay which involved “half” a surgery. Thus my sister and I lived at the hospital for the few days, watching really funny films in the cafeteria (The Maze Runner, anyone?) and knitting to keep her company. So this post is dedicated to her and the hopeful speedy recovery. 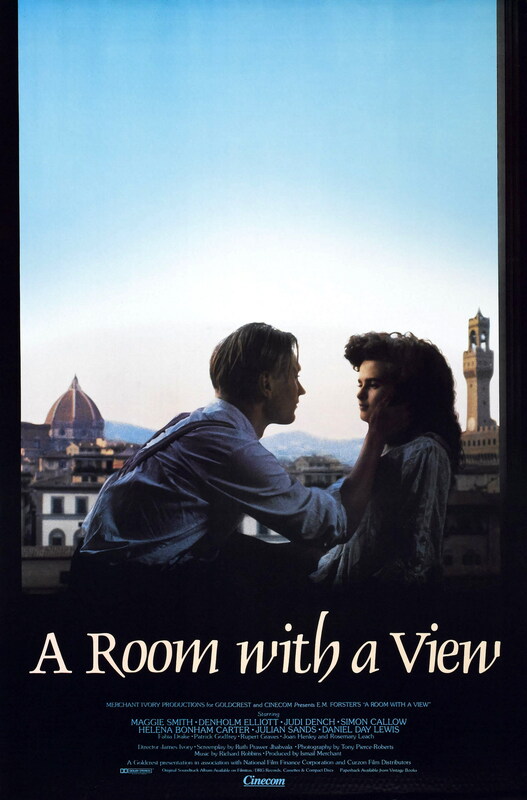 The Room with a View, directed by James Ivory (and named so, because of the book of the same name) is a British Romance with a mixture of Drama. It’s a great one, the film is separated in the name of the book chapters in each segment of the film. The story follows a young lady, Miss Lucy Honeychurch who travels to Italy with her older chaperone of a cousin, Charlotte Bartlett. Charlotte is this ridiculously more conventional english lady, if you had to imagine the traditional British woman with all the specific values and morals, this would be her. Charlotte is actually played by Maggie Smith, an actress that I’ve grown to love over the years. They’ve travelled to Italy for vacation and discovers that they’re the ones in contrast to the free-spirited and lively backdrop of this country. They end up staying at a small pensione, where it seems the rest of the guests are slightly similar to where they were brought up (english and countryside), but there was definitely an exception to this. There was a father-son duo, who stood out. Mr. Emerson and his super good looking song, George were their names. Mr Emerson was a non-conformist, but polite and just loving. He was the one who offered to change rooms with the ladies, because they thought they were getting a view “Ladies enjoy the view more”, his son George, was a philosophical man. And any young man who can carry thoughts like that on his shoulders usually immediately attracts the main leading lady without trouble. In the film, they called them forward-thinkers (comparing to the norm of the Victorian thinking). Thus Lucy is attracted to this mysterious bloke. While gring up and trying to figure out her maturity in Italy, she slowly realizes her own feelings toward George. One day, most of the guests at the pensione descides that it was a fine day to take a caridge ride to the countryside. Everyone heads out, and at some point- while eveyrone is stopped on the side, eating lunch and looking cute, Lucy is directed to this field. Guess who was in the field! George! He immediately steps toward her and they embrace and kiss, as if it was instant true love. Unfortenately, Lucy was followed by her champeron, Charlotte and the chemestry is instantly broken. She warns Lucy to not tell anyone, to save her own reputation (but secretly to save the reputation of herself). So that’s what happened. The trip to Italy eventually melts away, and everyone returns to whatever lives they had prior to. 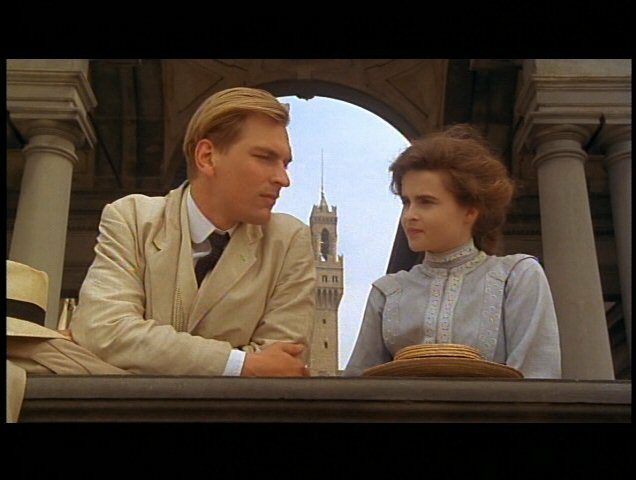 Lucy, not telling anyone of what happened in Italy (not even her own mother, who apparently she keeps no secrets from) is engaged and set to marry a clever, but snobby guy named Cicil. That was her life, or so she thought. Fast forward a couple of scenes and bam! guess who moves to the small town of wherever they are from? George and his father of course! Feelings resurface, there is some comedy of naked Englishmen swimming around and being caught and the engagement is eventually cancelled, because of course, her feelings are resurfacing and she is an honest lady. But she won’t run to George yet. She thinks she needs to figures out, and plans a trip to Greece right after ending the engagement. Mr. G confronts her before going and next thing we know, they are in Italy getting engaged in a room with a fantastic view. The end. Honestly, the story outline is so corny, you can only predict whats going to happen. But there is some comfort in knowing everything will be alright for the character. I liked the unconventional characters, a “modern-ish” thinking Victorian family, a fuzzy haired girl falling for the dark and mysterious type. It gives for a good, warm hug of a film. I wished there were more scenes concerning George though, developing his character a bit more. It seemed too little and I was left wanting more from him. Hopefully someone else eventually remakes the film in a few years and maybe they will take a hint from my book. 7/10. Drink earl grey and enjoy it.